It's the product customers have been begging us to provide for years — a Split Ergonomic keyboard that gives you all of the tactile feedback, greater comfort, faster typing speeds, and quiet operation of ALPS-inspired mechanical keyswitches. With built-in leg supports for Tilting and Tenting, this unique keyboard supports 9 degrees of tenting and 4.5 degrees of negative tilt. Or just use it flat, whatever fits your specific needs. What's more, the sections can themselves be moved farther apart or closer together rapidly, allowing for shoulder-width extension and travel without sacrificing usability or efficiency. 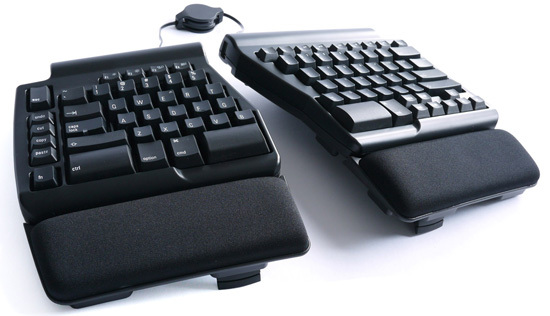 The Ergo Pro layout increases typing comfort and decreases fatigue. Sections independently adjust to each person's natural typing posture. Narrow footprint for a more natural Mousing position. Built-in retractable leg supports for tenting and tilting. Spacious removable palm supports for comfort. ALPS inspired Quiet-Click Mechanical keyswitch technology. Anti-Ghosting circuitry for N-key rollover. LEDs for Caps Lock and Num Lock. Built-in Audio and Media controls. Dedicated keys for Undo, Cut, Copy and Paste. Sculpted and Laser etched keytops.